White men can’t jump, but they sure can rebound! Wow, Minnesota must “Love” this kid. 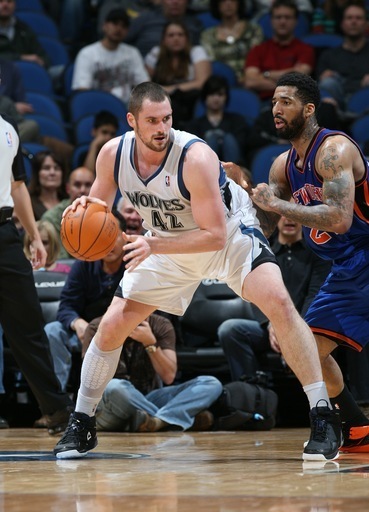 In case you missed it, Kevin Love of the Minnesota Timberwolves recently had the game of a lifetime. On Friday night, he had 31 points and 31 rebounds in a big win over the New York Knicks. Yes, you read that right. 31 points in a game is great by itself. 31 rebounds in a game is absolutely crazy in a game by itself. But to have all of that in one game…are you serious!? Back in the stone ages, when Wilt Chamberlain and Bill Russell used to average 20-plus rebounds a game, a 30-30 game wasn’t too spectacular. But nowadays, 30 rebounds in a game is an incredible feat. Heck, a total of 30 rebounds in two games combined is impressive. Over the last few decades, the leading rebounder in the NBA has usually averaged around 15 rebounds per game, give or take a few. Kevin Love did something that hadn’t been done in 28 years. Moses Malone was the last player to do it, when he had 32 points and 38 rebounds in a game in 1982. Love wasn’t even alive yet. Kevin Love isn’t incredibly tall (in NBA terms), as he stands in at 6’10. He also isn’t known for ability to jump out of the gym (insert white-basketball-player-joke here). So how the heck did he do it? “It seemed like no matter what anybody did I was going to go and get those rebounds. I don’t know what to tell you,” Love said to reporters following the game. This confidence and determination, combined with a whole lot of lucky bounces and good box-outs, is what helped Love reach the mark he did. Is this going to give Kevin Love some momentum and a chance to really get his NBA career going? Who knows. All I know is that if continues to play like he did on Friday, he is going to be an absolute stud in the league for a long time to come. Congrats, Mr. Love, on one of the most impressive games in a long time.